Most common in wet meadows, marshes, edges of lakes, ponds, and streams, and other riparian areas (grows best on gentle slopes.) Adapted to a variety of mineral and organic soils with a pH tolerance range of 3.0-7.9. Grows in areas where water is up to 32" below the soil surface, as well as areas with standing water to 39" deep. Common in recently formed beaver ponds and on sites with a high water table. (www.rook.org). Facultative Seral Species (www.fs.fed.us). 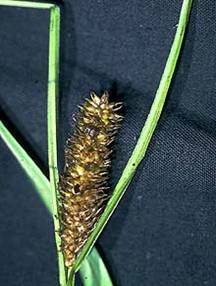 Beaked sedge is a frost-tolerant, prolific seeder and is usually dominant or codominant where it occurs. It has climax ecological status on wet sites of the Cascade Range. Beaked sedge communities have little species diversity, and invasion is limited by the dense rhizome network. Often succeeded by willows (Salix spp. ), rushes (Juncus spp. ), and reed grasses (Calamagrostis spp.) (www.rook.org). Shoots emerge between July and August but may also emerge in the fall. Flora primordia develop in August or September. Begins producing new green leaves in early spring; growth at this time is rapid. There is a decrease in root biomass, and most energy is allocated to height increment. In July, when almost at its full height, energy allocation is shifted to shoot production. Lifespan is 2-6 years (www.rook.org).